Crape Myrtles (Lagerstroemia) are very popular shrubs for warmer areas, and no wonder. They have spectacular blooms for an extended period, grow well in poor soil, and are heat and drought resistant. They also come in many sizes, so there is a plant for every purpose around the garden, from specimen tree to low shrub or container plant. If you grow Crape Myrtles in your garden, you may see some damage to the leaves, and this is often the result of two diseases that attack Crape Myrtles. The good news is that if you choose the right varieties, and don’t settle for cheap plants simply sold as ‘Pink Crape Myrtle’, without giving a proper variety name, you can usually avoid these diseases. If you already have Crape Myrtle bushes, and see symptoms of disease, here are the two most likely causes. This is the most common disease seen on Crape Myrtles, and it is easily recognized. In summer you will see the foliage start to look ‘dusty’, as a whitish powder builds up on the leaves. It begins as patches, and soon spreads until it may cover the leaves almost completely. These white or beige spots also appear on the new shoots, and on the outside parts of the flower buds. Often the new shoots and flower buds become twisted and deformed, so that flowering suffers, and only the first spring flush of flowers is attractive. Shoots can even wither and die back, adding to the unsightly look of your plants, and stunting their growth. This disease – caused by a fungus called Erysiphe – is also seen on other garden shrubs, including lilacs and roses, but each plant has a specific form that only attack it, so powdery mildew on Crape Myrtle cannot spread to lilacs, or vice-versa, although they may appear simultaneously during suitable weather conditions. 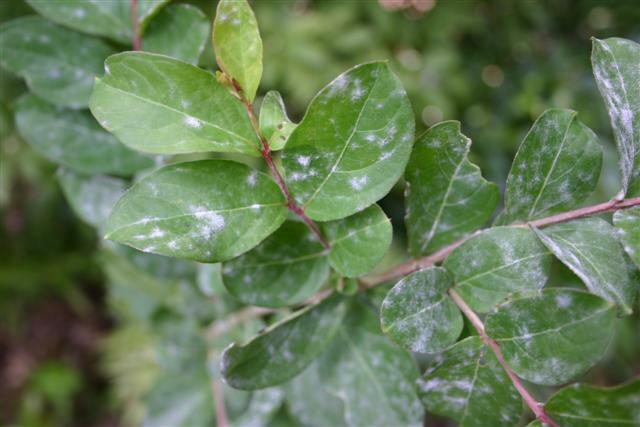 Powdery Mildew of Crape Myrtle can be seen as early as mid-April, but it is much more common in June, when the dryer weather, warm days and cool nights create the perfect conditions for its spread. Once the mildew spreads across the plant it cannot be removed, so even if killed it remains unsightly. It does not however normally kill the plant, and heavily-infected plants will sprout the following year with fresh, healthy, clean growth. The disease passes through the winter sitting on the leaf buds, so as soon as the weather becomes favorable, back it comes. This disease has been a problem since Crape Myrtles were first introduced into the USA, and in the 1960s plant breeders at the National Arboretum in Washington, D.C. began breeding new varieties, with the specific goal of finding plants that would not get Powdery Mildew – plants that were resistant, and that would stay attractive all summer long. They bred over 20 new varieties, all with the names of Native American tribes, and most show good levels of resistance to this disease. Rather than trying to control it with chemical sprays, plant newer varieties, and take advantage of their resistance. Names like ‘Natchez’, ‘Tonto’, or ‘Cherokee’ all indicate varieties that will resist Powdery Mildew well. If you do have plants of old varieties you treasure, there are steps you can take to reduce the risk of this disease developing. Removing diseased leaves as they fall, keeping plants watered, using low-nitrogen fertilizers to reduce soft growth, eliminating heavy pruning, and spacing plants for better air-circulation, are all methods that will reduce, even if not eliminate, the disease. Milk, diluted 50%, has been proven to reduce or prevent powdery mildew, but it must be sprayed frequently from early in the season, and certainly after any rain has fallen. This could see you spraying every few days. Otherwise your local garden center can advise you on chemical controls, but these too must be applied every couple of weeks. It makes sense to instead look for and plant resistant varieties. This disease is not as well known as Powdery Mildew among gardeners, but it is a serious disease of Crape Myrtles, and one that has become more widespread in recent years. Perhaps because it occurs later in the year, it is seen as ‘natural’ and not as the damaging disease it is. Cercospora Leaf Spot begins on the lower foliage of a Crape Myrtle bush, and the leaves develop irregular brown circles, about ¼ of an inch across. As these spots spread and multiply the leaves may take on ‘fall’ colors, turning yellow or red before dropping to the ground. You might start to see spots on the lowest leaves as early as late-June, but it is more usual from early July, increasing through August, so that by mid-September 50% of the leaves may be gone. If this sounds like your plants, it is not fall coming early, but Cercospora Leaf Spot. As with Powdery Mildew, the best approach is to choose varieties that are resistant to the disease. Resistant plants may still show a few spots, and a few leaves may drop, but these will only be the lowest leaves, and the effect is almost unnoticeable. Many of the National Arboretum Crape Myrtle varieties are resistant to this disease, as well as to Powdery Mildew, and the ones already mentioned above are good choices. Others may not be. For example, ‘Hopi’ and ‘Comanche’ are varieties that resist Powdery Mildew well, but they do not resist Cercospora Leaf Spot at all. So choose carefully. Many more modern varieties, such as the ‘Magic’ series developed more recently by the plant breeder Dr. Michael Dirr, all have good resistance to both diseases. Names like ‘Purple Magic’ are ones to look for. As well, in this range are varieties like ‘Plum Magic’ and ‘Sunset Magic’, that have purple foliage as well as attractive blooms. Again, if you have old plants that you can’t bear to part with, you can control this disease by the same methods mentioned above for Powdery Mildew. There is no evidence that milk works against this disease, but it might. Most of the chemical controls for Cercospora Leaf Spot also work on Powdery Mildew, so a single spray, repeated as recommended, will give you control over both diseases. Over several years, if you can successfully control these diseases, the rate of natural infection may fall, and less control will be needed. In any case, only use chemicals when you begin to see the first symptoms, not as a ‘just in case’ measure, where you could be spreading chemicals around your garden needlessly. Neither of these diseases will kill your Crape Myrtles, but they are definitely unsightly, and the gradual loss of leaves from Cercospora Leaf Spot means you lose most of the wonderful fall display these plants give. When choosing new varieties, look for resistance to both diseases, and you will have beautiful, trouble-free plants that look great from early spring right into winter. Enjoy!